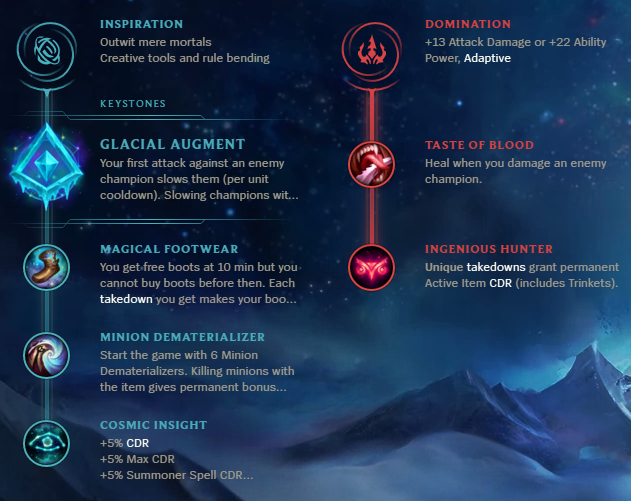 The newest kid on the block after the recent Vel'Koz hype is Glacial Augment Ahri, who's quickly taking the world by storm. Although most players still opt for Electrocute as their keystone, most of the pros are now using Glacial Augment to maximize their skill shot hit percentage and increase consistency. It's exceedingly strong and gives Ahri a lot more uptime on "doing things" as a result of the actives. Similar to Vel'Koz, Ahri's got plenty of damage but a lot of slow skill shots that need to hit in sequence to maximize her damage. By applying slows on enemy champions, Ahri has a much easier time hitting her powerful spells and maximizing her full combo attack. When it comes to engagement potential, Ahri is already incredibly strong for mage. However, once you add Twin Shadows and GLP into the mix, she can effectively engage even without landing her charm. This makes her an incredibly potent champion for catching multiple enemies off guard and out of position. The addition of the Glacial Augment slow allows Ahri more freedom to land early game charms for impactful trades. Later on she may not want to use it as much simply because the range is so small. However, by this time she'll have more powerful active slows at her disposal to achieve the same effect. Although most players are more than willing to trade damage for survivability (see tank Viktor), this version of Ahri does do significantly less burst damage compared to Electrocute Ahri. This means that enemies get away a little often than you'd expect. The slow on Glacial Augment helps Ahri land her spells with more frequency. However, if you're already good at landing charms, the rest of her kit isn't exactly hard to follow up with afterwards. As a result, her early to mid game trade power and kill potential is greatly reduced. This version of Ahri isn't much weaker than Electrocute Ahri, and offers much more to team fights. 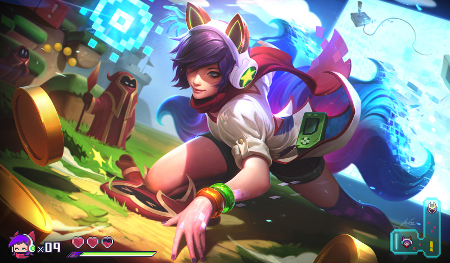 If you're not that good with your skill shots or simply think that you want to add a little extra utility to a team, playing Ahri like this is definitely very powerful.